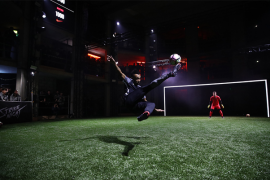 The ultimate striker’s competition for Nike helped launch a new boot and was described by Campaign Magazine as ‘the experience we all wished we’d created’ winning the Grand Prix at the Campaign Event Awards. Strike Night pitted six elite players head-to-head in a finishing battle scored by the world’s first full-size, fully interactive LED goal and it was broadcast globally on Facebook Live, VK, and Twitch. The competition challenged players to score as many points as possible with the LED net measuring their shooting accuracy and responding with bespoke animations triggered while the goal tracked the exact placement of shots. The score from the digital goal was topped up by judges and votes from the highly-engaged Facebook Live audience who voted to give 500 points to the most stylish player in each match. After a fierce battle, Portuguese international André Silva was crowned the champion. The launch plan leveraged Nike athlete, retail and media partner channels resulting in 3.3 million views of the broadcast on its first day alone.